Robomow RX12 Robotic Lawn Mower comes with a very distinct use case. It is designed for lawns that are less than 2000 sq.ft in size. Most of the lawn mowers out in the industry are designed for areas of 1/4 acre and above. But Robomow RX12 is designed for miniature lawns that take up less than 1/20th of an acre. 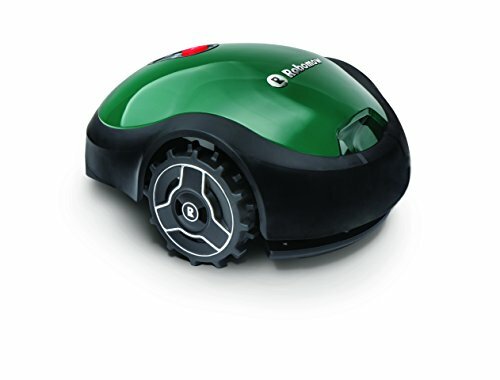 Robomow RX12 is one of the most affordable and best Robotic Lawn Mowers out in the market. Since using a manual robotic lawn mower to mow a small lawn is impractical, this cute robotic lawn mower is the best way to trim your lawn. Follow along to read our review of the “friendliest” Robotic Lawn Mower ever made. Robomow RX12 is one of the lightest and also the easiest to setup in the market. Robomow RX12 comes with everything that is required to install in a mini lawn. The perimeter wire and pegs included with Robomow RX12 can cover most of 2,000 sq ft lawns. Setting up is like any other robotic lawn mower. Since it ships complete with water-tight wire connectors for splicing, roboruler for wire placement and base station for automatic charging along with 100 pegs and 230 ft of wire, Robomow RX12 is very easy to setup and use. Like all its products, Robomow RX12 Robotic Lawn Mower is very compact in design. Robomow RX12 looks Roombaesque and weighs just 16lbs. Its characteristic green color makes the product even more attractive and makes for a great addition to your lawn. Since the RX12 makes a very low noise, it does it works without anyone noticing. The mowing performance of RX12 is lower than the other Robomow products. Since its cutting width is only 7 inch, it fits very well into corners. At the same time, due to the low cutting width and not so powerful motor, it takes some time before your lawn is completely mowed. That said, the Robomow RX12 uses random pattern and covers all of the area in the lawn. The Robomow RX12 is not designed to work in lawns with steep surface. Since it is not automatic, one has to manually press the Go button for the Robomow RX12 to start. With a mowing time of 90-120 minutes, the RX12 is sufficient enough to cover a lawn of <2000 sqft. The Robomow RX12 comes with a 1 year warranty that covers the labor and parts. RX12 is essentially a maintenance free product with very little care to be taken. Since the Robomow RX12 is very compact, most of its parts are not available for replacement. That said, the product comes with very little requirement for replacement of parts. Robomow RX12 blades stop rotating immediately when it is lifted from the ground.The Robomow RX12 features a child lock system that keeps the children away from operating it. This wonderful robotic lawn mower also features an anti-theft system which works based on PIN you have set. Overall it is a safety first product and is very easy to keep it secure and safe.